Composition: Epiruba- 50: Each vial contains Epirubicin Hydrochloride USP 50 mg solution for injection. Indications: Epirubicin Injection is indicated as a component of adjuvant therapy in patients with evidence of axillary node tumor involvement following resection of primary breast cancer. Dosage and Administration: When possible, to reduce the risk of developing cardiotoxicity in patients receiving Epirubicin after stopping treatment with other cardiotoxic agents, especially those with long half-lives such as Trastuzumab, Epirubicin-based therapy should be delayed until the other agents have cleared from the circulation. Epirubicin Injection should be administered by intravenous infusion. Epirubicin is given in repeated 3-to 4-week cycles. The total dose of Epirubicin may be given on Day 1 of each cycle or divided equally and given on Days 1 and 8 of each cycle. All drugs administered intravenously on Day 1 and repeated every 21 days for 6 cycles. Patients administered the 120-mg/m² regimen of Epirubicin should receive prophylactic antibiotic therapy. Or, as directed by the registered physician. Use in Pregnancy and lactation: Pregnancy Category D. There are no adequate and well-controlled studies in pregnant women. It should be used in pregnancy only if the potential benefit justifies the potential risk to the fetus. It is not known whether this drug is excreted in human milk. Because of the potential for serious adverse reactions from Epirubicin in nursing infants, a decision should be made whether to discontinue nursing or to discontinue the drug, taking into account the importance of the drug to the mother. Pediatric Use: Safety and effectiveness of Epirubicin have not been established in pediatric patients. Pediatric patients may be at greater risk for anthracyclineinduced acute manifestations of cardiotoxicity and for chronic CHF. The pharmacokinetics of Epirubicin in pediatric patients have not been evaluated. Geriatric Use: Although a lower starting dose of Epirubicin was not used in trials in elderly female patients, particular care should be taken in monitoring toxicity when Epirubicin is administered to female patients ≥ 70 years of age. 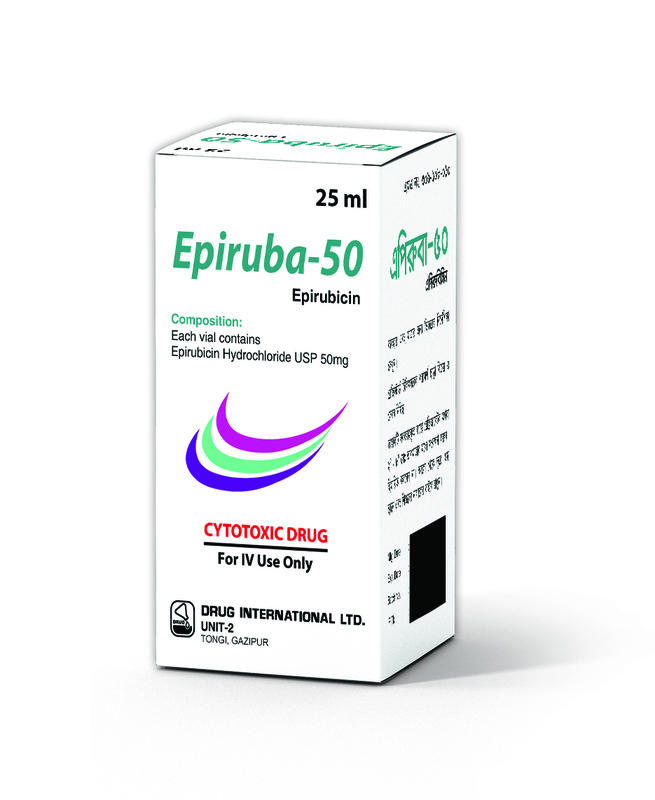 Packaing: Epiruba- 50: Each box contains one vial of 50 mg Epirubicin Hydrochloride solution for injection.